I loved the hot breakfast, the room was exactly what we needed in this situation, & the location was perfect. Nothing, the online rate the day I arrived was cheaper than what I paid w booking.com I requested a room w two queen beds and a tub. We come after a Spartan race and a tub is vital. No tub in the room back to the lobby now we get 2 full size beds not queen we paid for but a tub. The next room has a bathroom ceiling covered in black mold so they say they will send someone to clean it. Sorry I don’t want to stay in a room that is filled with bleach smell. Moved to yet neither room, still small mount of black mold on ceiling above tub and wall paper peeling. Don’t bother booking here, rooms re crap and VERY much in need of an update Nd deep cleaning. staff: amazing! breakfast: so-so cleanliness: zero. everything is quite too old, bathrooms need upgrade, carpets too, my room had a strong bleach odor hard to get rid of. the entire hotel, smells the same. 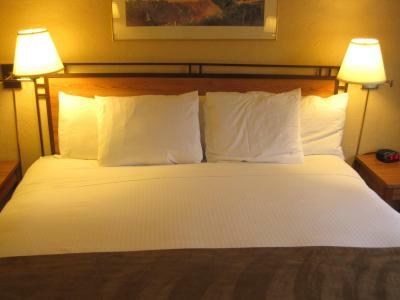 location: amazing rate: it’s pricey, based on the lack of maintenance and cleanliness in your hotel. it, definitely, will be my last time there. i will rather pay a bit more, for better quality. Better than expected. Everything was fresh and food was hot. The proximity to the Space Needle and Monorail was perfect. The room was small, clean and comfortable. The front desk staff was very pleasant and helpful. Lots of smiles and eye contact. That means alot to me. 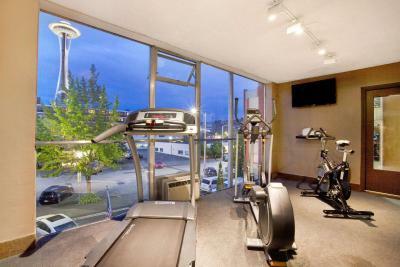 Location, Location, Location...can walk to the Space Needle, park, other attractions. Location was the best part. 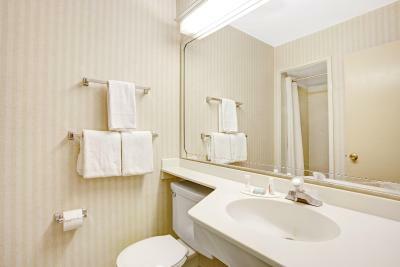 Easy access to downtown and tourist locations. Location is the main draw for this hotel. 10 minute walk to The Space needle and surrounding museums. 25 minute walk to Pike Place and 35 minutes to Pioneer Square. 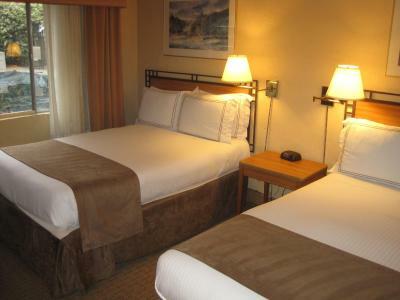 Travelodge by Wyndham Seattle By The Space Needle This rating is a reflection of how the property compares to the industry standard when it comes to price, facilities and services available. It's based on a self-evaluation by the property. Use this rating to help choose your stay! 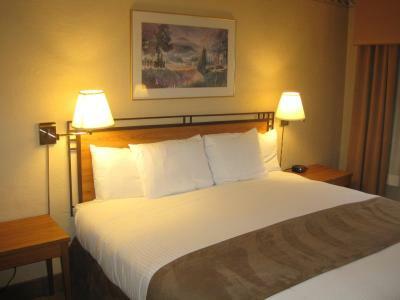 One of our top picks in Seattle.Free WiFi is available in all rooms at this Seattle hotel. 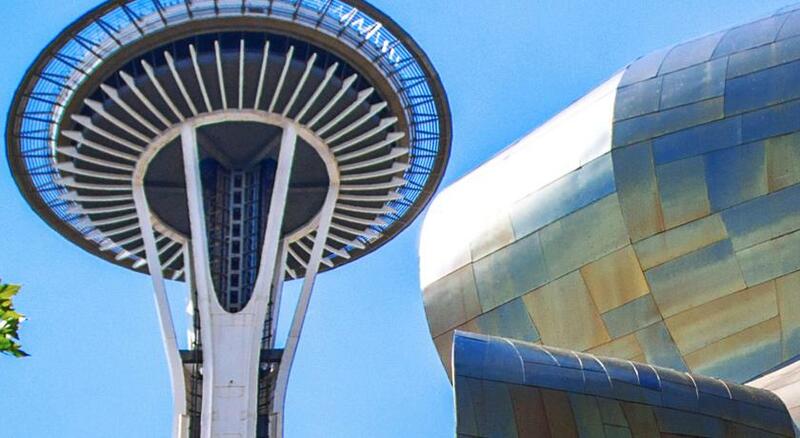 The Seattle Center, EMP Museum and the Space Needle are all within 5 minutes’ walk away from Travelodge by Wyndham Seattle by the Space Needle. 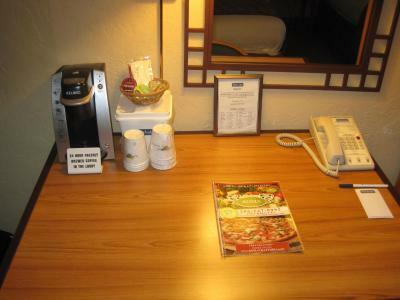 A complimentary hot breakfast buffet is provided daily. 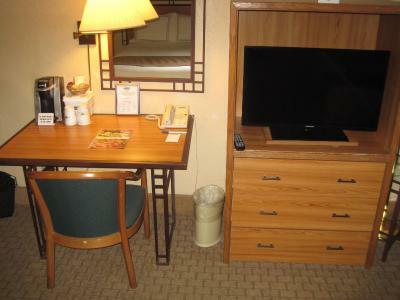 Satellite TV is featured in all guest rooms at the Travelodge by Wyndham Seattle by the Space Needle. A seating area with a work desk is also included. 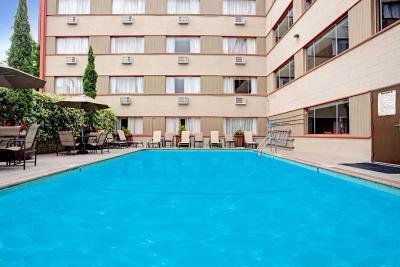 Pool-side sun loungers are provided on the sun deck at the Travelodge by Wyndham Seattle by the Space Needle and guests can enjoy the outdoor pool and on-site hot tub. 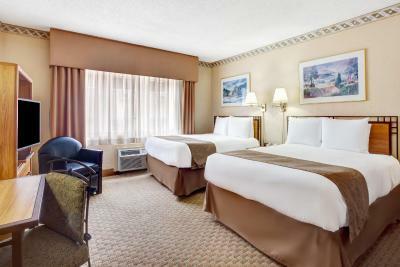 A fitness center and a 24-hour front desk are available for guest convenience. Laundry service is offered. A hot and cold breakfast buffet is offered from 6:30 until 9:30 daily. Guests can enjoy a variety of breakfast options, including cereal, pastries, fruit, eggs, coffee, and tea. The Seattle Center Monorail, offering easy access to downtown shopping and attractions, is less than 5 minutes’ walk from the hotel. The University of Washington is 10 minutes’ drive away. 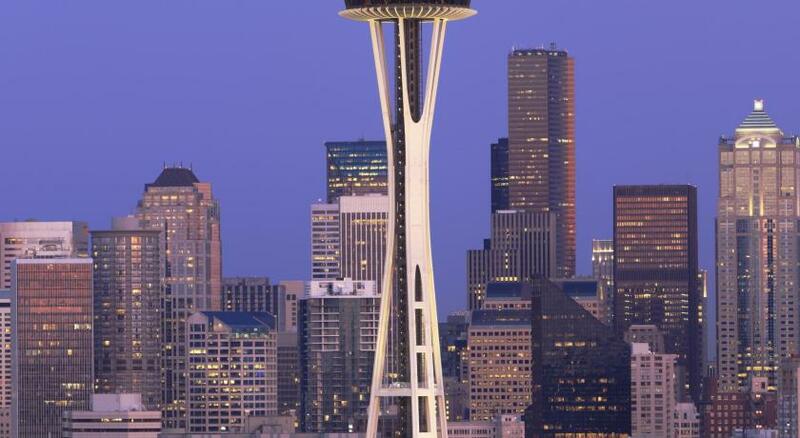 South Lake Union is a great choice for travelers interested in tourist attractions, sightseeing and atmosphere. 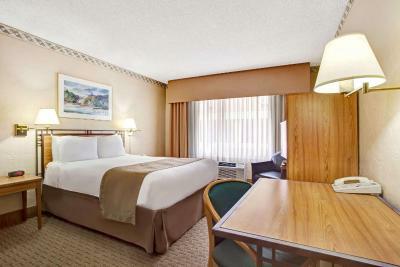 When would you like to stay at Travelodge by Wyndham Seattle By The Space Needle? 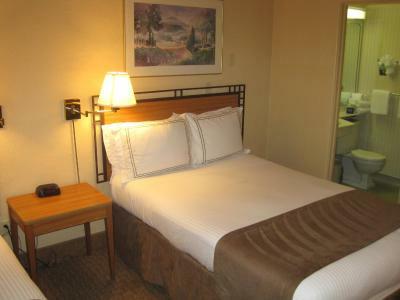 This triple room has a tea/coffee maker, air conditioning and seating area. This queen room has a tea/coffee maker, air conditioning and seating area. 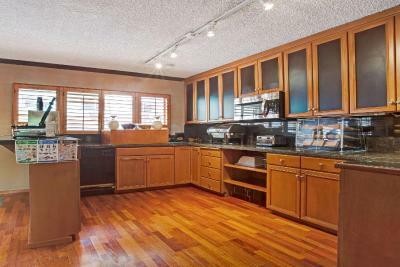 This family room has 2 double beds, a tea/coffee maker and air conditioning. This family room has 2 queen beds, a tea/coffee maker and air conditioning. Our hotel was built before the Space Needle and can be seen in the background of many of the photos taken at the opening during the World's Fair in 1962. Although none of our rooms have Space Needle views, you can see it by looking out any of our hallway windows. 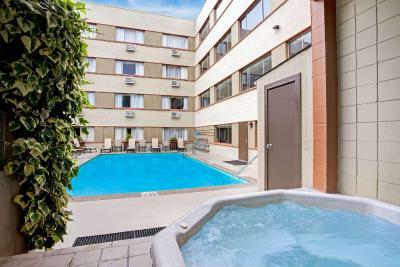 There are also great views from our pool, which is one of the few outdoor pools left in the city. 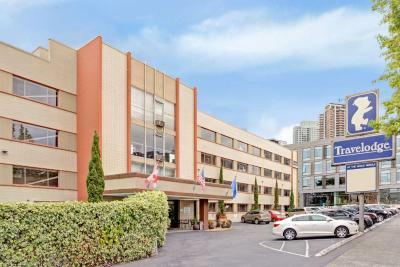 Hotel surroundings – This neighborhood is a great choice for travelers interested in tourist attractions, sightseeing and atmosphere – Check location Great location - show map Guests loved walking around the neighborhood! 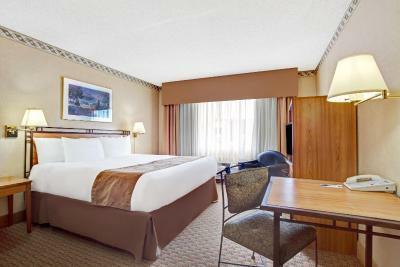 House Rules Travelodge by Wyndham Seattle By The Space Needle takes special requests – add in the next step! Travelodge by Wyndham Seattle By The Space Needle accepts these cards and reserves the right to temporarily hold an amount prior to arrival. Check in was at 3:00 our room was not yet cleaned so we had to wait another hour . Sadly to say this is the worst hotel I have ever stayed in and I have traveled a lot . Very dirty . Carpet stained very badly . Poor odor coming from the halls , curtains were ripped I was scared to even walk on the floor .. no security the front door key pad was broken .. Sadly to say honestly felt like I was better off sleeping in my car since it seems cleaner .. the pictures online are very deceiving . I was very disappointed and would never stay at a travelodge again . I literally have nothing negative to say about my experience. This hotel actually exceeded my expectations especially since this our first time staying there. Unlike the first time I stayed, the parking cost $15 where as before it was free. The bathroom was in rough shape on the cosmetic side. Wallpaper worn and patchy. Also (I know this is not the hotels fault) but there was construction going on right under our window all night long so sleep was impossible. We would have preferred a quieter room possibly on the upper floors. Check in was easy although my credit card was denied ( I recall this happening on my previous stay a few years ago with my mother, only it was her credit card). Room was spacious and comfortable. Especially the bed! Free coffee all day and night. 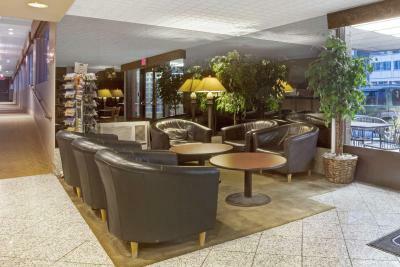 And you can't go wrong with free breakfast, on site parking and location with a monorail to downtown. Good Location near the Needle, friendly staff, OK for a stopover. Very noisy upstairs. Water flow in shower really bad. Room too small. Ac/heat very loud. Bathroom too small. it was clean, mold in the bathroom, dirty carpet. bleach smell, combined with dirty odor. The shower was nice but would be narrow/small for a larger person. Shower head was up quite tall and not positionable. The photos did not accurately portray the condition of the hotel. The entire hotel was run-down and dirty. For the amount of guests staying there (it was full the nights we were there), management could afford a total remodel. Despite previous recent reviews were management indicated remodeling was underway, this was not the case. There were no signs of remodeling or improvement. All of the carpet was stained and the rooms smelled of mold and mildew. This was causing me health issues and so we moved to another room, but the next room was just as bad. The furniture was dinged up and there were rips in the chairs. The bathroom was dingy and the sink was stained. The walls were paper thin and you could hear all conversations and TV in the next room. The breakfast room was extremely cramped and small. It was not pleasant to eat breakfast there. The photos portrayed this as a large room but in fact it was just an old converted hotel room. The food was cheap and mediocre. This is the worst hotel I've stayed at in Seattle and one of the worst hotel experiences I've ever had. There was nothing about this hotel that I liked or would recommend. The public areas of the facility were dirty and worn. 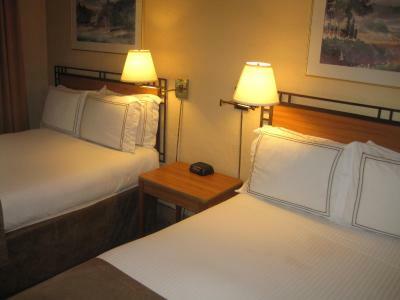 The clean room and comfortable beds made up for it. Carpets throughout the hotel were stained and very worn. Hotel could use a serious makeover. Breakfast selection was limited. We stayed for 5 nights and the same sausage and eggs every morning. A different meat would have been nice. Unsupervised children touching the food with their hands wasn't good. Older hotel thin walls very noisy room to room. No security at front door key entrance was broken. Location was great for us. Close to our daily appointments and downtown.